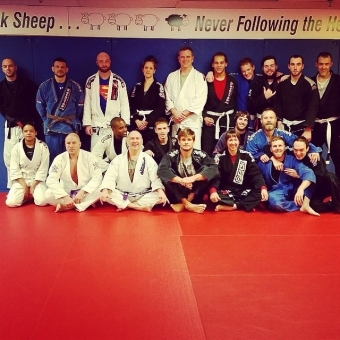 After competing in the IBJJf European Championships in Portugal, with Coach Amanda winning a Silver Medal, and touring and teaching at SBG United KIngdom and SBG Ireland, Coaches Amanda and John continued their travels to SBG Niagara for private lessons and a seminar. Private lessons started the week. From white belts to purple, everyone was given the utmost personal attention. Under the watchful eyes of the BJJ Black Belt Coaches, things started with some light rolling, the Coaches watched, saw where improvements could be made, and offered their expertise to help improve each athletes performance. The attention to detail that the Coaches adhere to is quite amazing. Every suggestion for improvement they offered worked for each athlete, and made a noticeable difference in their performance by the end of the lesson. For their seminar, Coach John covered fundamental movements for improving movement on the ground, and then moved onto guard retention. Coach Amanda covered defending cross sides bottom, and the material she taught is such high percentage that it's going to be tough to hold people down now. Every athlete I talked to too was more than happy with the material, and the common statements amongst the participants were about how relaxed, friendly and approachable Coach Amanda and John are. Whereas some BJJ Black Belts take it as an insult or something when a white belt asks them to roll, the SBG BJJ Black Belts sought out all ranks to roll with. They shared their time with everyone and treated all equally, regardless of rank. A big thank you to Coach Amanda and Coach John for coming in and sharing their skill and passion!